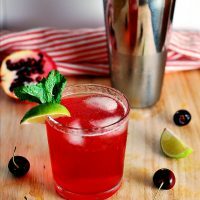 Refresh yourself on a hot summer day with a cherry pomegranate mojito: Cuba’s signature lime-and mint cocktail, flavored with fresh sweet cherries and pomegranate juice! I’ve been to Cuba Libre twice now, and haven’t gotten to try a pomegranate mojito, because I was pregnant both times I went. I finally decided to make one at home. I was actually going to make you a strawberry pomegranate mojito cocktail. But a certain toddler ate all my strawberries. So, I improvised with some cherries that had somehow not been eaten within two hours after their purchase. I think it’s because we also had some mango in the fridge. One fruit that boy loves more than cherries is mangoes. Anyway, this is still a really refreshing cocktail, which is easily adaptable to your taste. Want a stronger rum taste? Add more. Prefer a less-strong drink with more fruit flavor? Add more pomegranate juice. 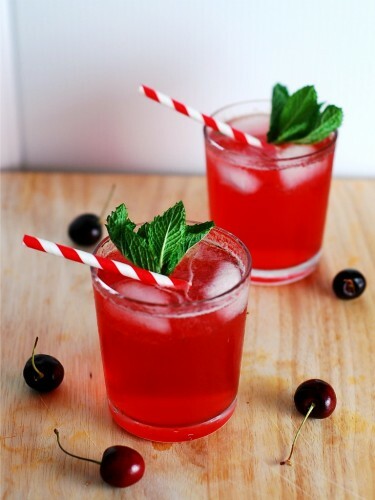 The cherries and pomegranate juice turn the drink a beautiful shade of pinkish red, and the green of the mint leaves provides a nice color contrast. This recipe makes four small drinks, which is perfect for an intimate get-together. It’s also a really pretty drink to serve to guests. Enjoy! 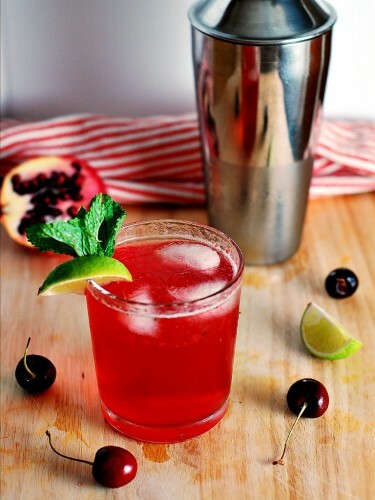 Place the cherries, mint leaves and lime juice in the bottom of a cocktail shaker. 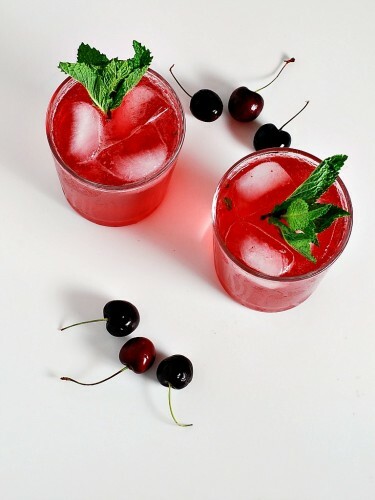 Use a muddler or the end of a wooden spoon to muddle the cherries and mint leaves by pressing them into the bottom of the shaker to release their juices. Add the pomegranate juice, white rum and agave syrup to the cocktail shaker, then fill with ice. Shake for 30 seconds, then strain the mixture into each of the rocks glasses. A favorite drink in the summer of mine is a mojito. I am now craving your cherry-pom version: looks fantastic and so refreshing! This is going on the drink list ASAP! Look amazing and refreshing. I love the vibrant red color of this cocktail! Just what I need on this Friday afternoon. So pretty and refreshing! Pinning! Pass me a glass, please! yum!!! Woohoo! On my list to my for book club night! Perfect way to get your drink on! Absolutely stunning photo and I love mojitos – this is one I can’t wait to try! That is one seriously summer cocktail! 😀 LOVE it! Oh wow! This looks great. Totally perfect for summer. I love your post! Those drink looks great too!! Whoa baby, Set me up with one those, Ms Bartender, if you please. We made this yesterday for Christmas dinner. I thought the garnish of mint and a candy cane would be perfect. After a sample run, I made a couple of changes. The pomegranate juice was very sweet, so I left out the agave. I also doubled the rum and increased the number of cherries from 6 to 10. It was a huge hit and I’ll make it again! I’m so glad you liked it, Paul!